The €2,200 Mixed Event title belongs to a player from Uruguay Alex Komaromi. He earned first gold breclet for him and for his country as well at the WSOP Europe currently in process at Spielbank Berlin Casino. A poker lover and player from the capital of Uruguay that is Montivideo , Alex has done really well at the final table of the game where many pro poker were taking their chances. Komaromi was very happy to win the title of mixed event and told reporters that he is from a poker playing family and his dad was also a pro poker player. This was the event#5 of the tournament. 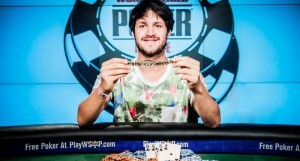 Alex won a gold bracelet as well as a very good cash prize of €65,740. The event number 5 of the championship was subscribed by 113 players to which 24 players got to play at the second day of the gaming. The total 113 entries to the game generated a cash pool prize of €219,220, which was separated in top 12 players of the event. 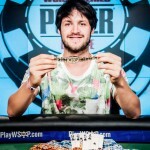 Alex Komaromi topped the list by winning his first gold bracelet and a cash prize of €65,740. Scott Clements comes second and booked for a cash prize of €40,645. Eights position of Event#5:- Igor Yaroshevskyy of Russia booked for €8,025. Ninth Position (9th):- Mikkel Plum of Germany grabbed €5,855 as winning total. Tenth (10th) Prize: – Mohsin Charania, an American poker player got 10th position and collected cash prize of €5,855. Eleventh place (11th): – is for Arnaud Esquevin. He earned his share of winning total as €4,275. Final twelfth (12th) position: – Bryn Kenney, is a first bracelet winner who booked for 12th position of the championship and collected €4,275 as cash prize. Do you also love to play poker and looking for a site to go for it? If the answer is yes then you’re at right place. Here is real poker online you would get latest poker news and only top notch legal poker sites operating in USA, UK and EU. Check this out for strategies.